The Austrian Crown Jewels (German: Insignien und Kleinodien) is a term denoting the regalia and vestments worn by the Holy Roman Emperor, and later by the Emperor of Austria, during the coronation ceremony and other state functions. 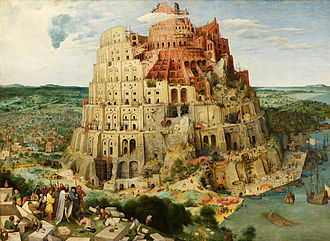 The term refers to the following objects: the crowns, sceptres, orbs, swords, rings, crosses, holy relics, and the royal robes, as well as several other objects connected with the ceremony. The collection dates from the 10th to the 19th centuries and reflects more than a thousand years of European history. It is kept at the Imperial Treasury in the Hofburg Palace in Vienna, Austria. The most outstanding objects are the insignia of the hereditary Empire of Austria. They consist of the Imperial Crown, the Imperial Orb and Sceptre, the mantle of the Austrian Empire, and the Coronation Robes of the Kingdom of Lombardy-Venetia. The Imperial Crown, Orb, Cross, and Holy Lance of the Holy Roman Empire are also highlights. The first five parts are also called the Weltliche Schatzkammer (secular/worldly treasury) and the ecclesiastical part the Geistliche Schatzkammer (spiritual treasury). The Schatzkammer is under the administration of the Kunsthistorisches Museum (Museum of Art History). Austria began as a small march and was later elevated to a duchy, then archduchy. 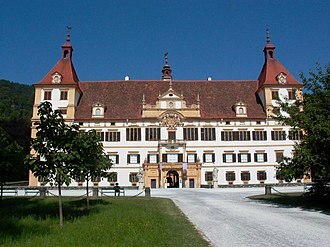 The house of Babenberg and later the Habsburg dynasty were the margraves, dukes and later archdukes of this fiefdom. After the death of the last Babenberg duke, Frederick II in 1246, King Ottokar II of Bohemia took over for a while. He was, however, defeated by the King of the Romans Rudolf of Habsburg in 1278, with the help of his sons Albert and Rudolf. Rudolf then installed his son Albert as Duke of Austria. The enthronement ceremony of the new Archduke of Austria was not an actual coronation, but more a ceremony of homage by the estates. In the German language, this ceremony is called the Erbhuldigung. The estates in parliament swore obedience to their new ruler, and he in turn guaranteed their rights and upheld their privileges. However, in this ceremony sovereign insignia were also used. The Insignia consist of the Austrian archducal hat or archducal coronet, which was made for Joseph II's entry into Frankfurt for his coronation as King of the Romans in 1764. The orb and the sceptre were in use as the royal insignia of the Kingdom of Bohemia until the early 17th century. The archducal hat is kept today at the Klosterneuburg Monastery in Lower Austria. Please see archducal hat for further information. The Crown of Rudolf II, later Crown of the Austrian Empire, (made by Jan Vermeyen in Prague in 1602). It is made of pure gold, partially enamelled and studded with diamonds, rubies, spinel rubies, sapphires, pearls, and cushioned with velvet. 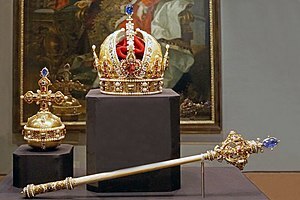 The crown and the insignia of the Holy Roman Empire were kept at Nürnberg and were used only for coronation ceremonies. For all other occasions the emperors had to commission personal crowns, which (except for this one) have survived only in illustrations. This crown was originally the personal crown of emperor Rudolf II. It is one of the most important works of the European goldsmith's art. Luckily this personal crown was spared the fate of many other crowns and not broken up after the death of the emperor in 1612. The Rudolphian crown has three distinct, principal elements, which symbolise the right to rule: the circlet with its fleur-de-lis mounts in the shape of a royal crown (Rudolf II was the King of Bohemia and Hungary), the high arch descending from the imperial crown, and the golden mitre symbolising the divine right of the emperor to rule. The pearls run in rows like lights. The crown is topped by a bluish-green emerald which symbolises heaven. In the four spherical triangles of the golden mitre, Rudolf is depicted in his four principal offices and titles: as victor over the Turks (Imperator), his coronation as Holy Roman emperor in Regensburg (Augustus), his ride up the coronation hill after his coronation as king of Hungary in Pozsony (in Slovak "Bratislava", in present-day Slovakia), and his procession at his coronation as king of Bohemia in Prague. The inscription inside the arch reads: RVDOLPHVS II ROM(ANORVM) IMP(ERATOR) AVGVSTUS HVNG(ARIAE) ET BOH(EMIAE) REX CONSTRVXIT MDCII (tr. "Made for Rudolf II, Roman emperor, King of Hungary and Bohemia, in 1602"). The choice and number of the stones used have allegorical and mystical significance. Eight diamonds decorate the crown: eight is a holy number referring to the octagonal body of the imperial crown; the diamond is a symbol of Christ. 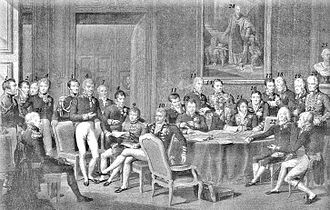 Under threat from Napoleon, emperor Francis II dissolved the thousand-year old Holy Roman Empire and proclaimed the Austrian Empire on August 11, 1804. He did not use the crown of the Holy Roman Empire but the old crown of Rudolf II as the crown of the new empire. For more detailed information, see Imperial Crown of Austria. The Imperial Orb and Sceptre (made by Andreas Osenbruck in Prague, between 1612 and 1615) were commissioned by emperor Matthias, the successor to Rudolf II. Both insignia were made out of the same material as the crown, and followed the same concept. 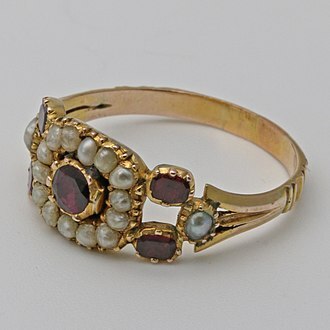 They are also partially enameled, and studded with rubies, sapphires and pearls. The Mantle of the Austrian Empire (designed by Philipp von Stubenrauch (1784–1848) and executed by Johann Fritz, Master Gold Embroiderer, in Vienna in 1830) was commissioned by emperor Francis I for the coronation of his son, Ferdinand, as younger King of Hungary. The mantle is made out of red velvet, ermine, and white silk, and pranked with a gold-embroidered scatter pattern formed of double eagles with the Austrian arms. The border is decorated with oak and laurel leaves. The Coronation Robes of the Kingdom of Lombardy-Venetia (also designed by Philipp von Stubenrauch and executed by Johann Fritz in Vienna in 1838) are patterned similar to the Mantle of the Austrian Empire, but made out of blue and orange velvet, with white moiré, gold and silver embroidery, ermine and lace. The edging of the mantle is accompanied by a line of medallions in which the Iron Crown of Lombardy is displayed. Parallel to this runs a broad ornamental border composed of sprays of palm fronds, oak and laurel leaves. 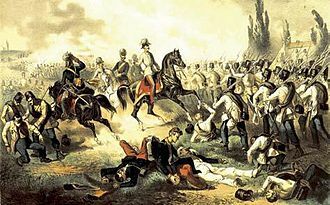 After Napoleon's downfall and the Congress of Vienna, the Kingdom of Lombardy–Venetia was created under Austrian rule. When emperor Ferdinand I was to be crowned King of Lombardy and Venetia in Milan on 6 September 1838, the question arose as to the choice of appropriate insignia and coronation vestments. Only the Iron Crown already existed. The rest of the insignia and vestments had to be newly commissioned. When the Austrians were forced to withdraw from Italy in 1859, the vestments were brought to Vienna. The Household Treasure contains items from the daily life of the Habsburg monarchs. The collection is vast and only a few highlights are featured regularly. The Cradle of the King of Rome was commissioned by the city of Paris as a gift to Napoleon and his wife Empress Marie-Louise, on the birth of their son Napoleon II. It was built by Pierre-Paul Prud'hon, Henri-Victor Roguier, Jean-Baptiste-Claude Odiot and Pierre-Philippe Thomire in Paris in 1811. The cradle is silver-gilt, and decorated with gold, mother-of-pearl, copper plates covered with velvet, silk and tulle with gold and silver embroidery, and signed on two of the feet: Odiot et Thomire and Thomire et Odiot. Angels hold a little baldachin over the head, and a bird sits at the foot. Bees, the symbol of the Bonaparte dynasty, decorate the sides. The cradle was more a horizontal throne with all its splendour, and a more practical cradle was also commissioned, which is in the Louvre today. Another notable item listed in the Household Treasure is the Crown of István Bocskay. This Transylvanian prince sided with the Ottoman Turks during their wars with the Habsburg empire. As a sign of their gratitude, the Ottomans sent him a crown, probably a Persian production from the 17th century. 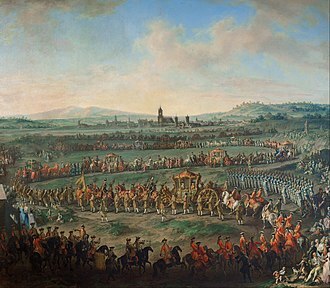 After his death, it was brought to Vienna in 1609. 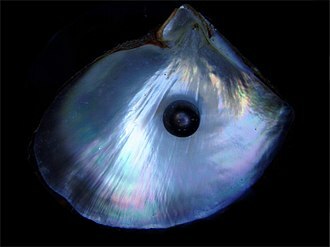 It is made out of gold, studded with precious stones and pearls, and laid in with silk. As crowns were not in use in the Ottoman Empire, it was modeled after the Byzantine kamelaukion (closed bonnet-like headdress), similar to those used in the Orthodox church. The crown has two main parts: a broad circlet with a wreath of fleurs-de-lis and a closed, spherical helmet rising from it. The frontal lily bears a Greek cross. Precious christening table clothes, robes, candles. Golden baptismal ewers and basins from Spain. An emerald Unguentarium commissioned by emperor Ferdinand II and produced in Prague in 1641 by Dionysio Miseroni. It is made out of a single piece of 2,680 carats (536 g) emerald, and enamelled with gold. Precious stones such as the Hyacinth "La Bella", and jewelry. The Imperial Regalia are the insignia of the Holy Roman Empire. After 1438, the Holy Roman Empire was ruled by the House of Habsburg, with only one brief exception. 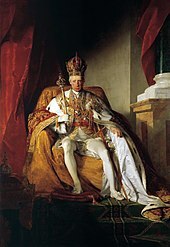 From 1508, after his election, the German King no longer called for the coronation by the Pope either, but considered himself Roman emperor directly. 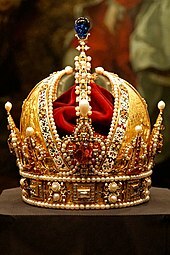 The crown was probably used for the first time for the coronation of Konrad II; the last time was for Franz II in 1792. 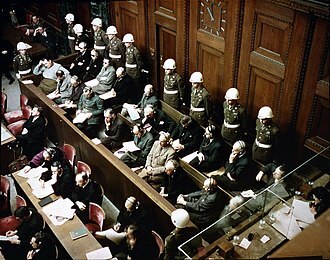 The regalia were normally kept in Nuremberg, and a smaller part in Aachen. However, with the advance of the French in the French Revolutionary Wars, they were taken away in 1796 and brought to Vienna for safety. They have remained in the Schatzkammer ever since, even after the dissolution of the Holy Roman Empire in 1806. The cities of Aachen and Nuremberg tried many times, unsuccessfully, to reclaim the regalia. The regalia briefly left Vienna after the so-called "Anschluss", when Hitler had them sent to Nuremberg in 1938. After the war they were found by American troops in a bunker and eventually returned in 1946. The Burgundian Inheritance are the items that are still left of the once-immense treasure of the dukes of Burgundy. It includes a precious pomp goblet that was created for Duke Philip the Good of Burgundy (ruled 1419-1467). It is set with gold and crafted out of single piece of rock-crystal. 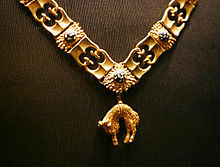 The Order of the Golden Fleece was one of the most prestigious orders in the Middle Ages and still exists today, alongside the Order of the Garter. The current head of the Order is Karl Habsburg-Lothringen. It was founded by Duke Philip the Good and Princess Isabella of Portugal in 1430. The Legend of the Golden Fleece goes back to antiquity, a well-known Greek myth, according to which Jason and the Argonauts stole the Golden Fleece from Colchis. The collection houses various items of the Order, such as neck chains of the knights, the Potence (Chain of Arms) of the Herald of the order, the liturgical vestments, altars, etc. The Ecclesiastical Treasury (Geistliche Schatzkammer) contains various pieces such as crosses, altars, reliquaries, icons, holy statues, and other items that were used for prayer by the court and the Habsburgs. The collection is vast, so only a limited number of items are on permanent exhibition, the rest are shown in cycles. The Reliquary Cross of King Louis I of Hungary is a double-cross made out of gold with silver-gilt, enamel, and precious stones. In it, pieces of the True Cross of Christ are said to be preserved under rock-crystal. This reliquary cross used to belong to King Louis of Hungary, and was probably produced either in Hungary or Naples, probably between 1370 and 1382. The House Altar of Jasper was made by Ottavio Miseroni in Prague, probably around 1620. The Reliquary with a Nail from the Cross was made in Augsburg in the mid-17th century. The Feather Picture of the Virgin Mary was made by the Purépecha Indian artist Juan Baptiste Cuiris in Michoacán (Pátzcuaro), Mexico, around 1550-1580. It is a picture of the Virgin Mary, made completely out of sparkling Hummingbird and parrot feathers. The Mexican Indian artists from Amentaca were famous for their traditional skills in producing art out of feathers. There are all in all seven feather-pictures in the treasury, making it the largest collection of such specific items. It belonged to the collection of Emperor Rudolf II. The Ainkhürn (horn of a unicorn) was originally thought to be the horn of a unicorn and was considered more valuable than gold, since magical healing powers were ascribed to it. The hilt of a sword was made from it, as well as a tankard. In reality, the horn probably came from a Narwhal. The Agate Bowl (Achatschale) is a bowl whose inscriptions are said to refer to Jesus Christ. It was at one time regarded as the Holy Grail. ^ Leithe-Jasper 2004, p. 10. ^ Trenkler 2004, pp. 132–135. Brook, Stephan (2012). DK Eyewitness Travel Guide: Vienna. London: Dorling Kindersley Ltd. ISBN 978-0756684280. Gaillemin, Jean-Louis (1994). Knopf Guides: Vienna. New York: Alfred A. Knopf. ISBN 978-0679750680. Kunsthistorisches Museum Wien (1991). The Secular and Ecclesiastical Treasuries. Vienna: Residenz Verlag. ISBN 978-3701706860. Leithe-Jasper, Manfred; Distelberger, Rudolf (2004). The Kunsthistorisches Museum Vienna: The Imperial and Ecclesiastical Treasury. Vienna: Scala Publishers. ISBN 978-3406429385. Schnorr, Lina (2012). Imperial Vienna. 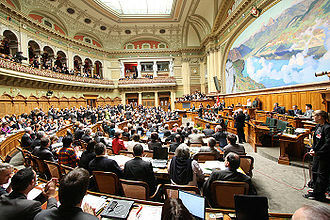 Vienna: HB Medienvertrieb GesmbH. ISBN 978-3950239690. Trenkler, Thomas (2004). The Vienna Hofburg. Vienna: Verlag Carl Ueberreuter. ISBN 978-3800070435. Unterreiner, Katrin; Gredler, Willfried (2009). The Hofburg. Vienna: Pichler Verlag. ISBN 978-3854314912. Wikimedia Commons has media related to Crown jewels of Austria. Ottokar II, the Iron and Golden King, was a member of the Přemyslid dynasty who reigned as King of Bohemia from 1253 until 1278. He held the titles of a Margrave of Moravia from 1247, Duke of Austria from 1251, Duke of Styria from 1260, as well as Duke of Carinthia, with Ottokars rule, the Přemyslids reached the peak of their power in the Holy Roman Empire. 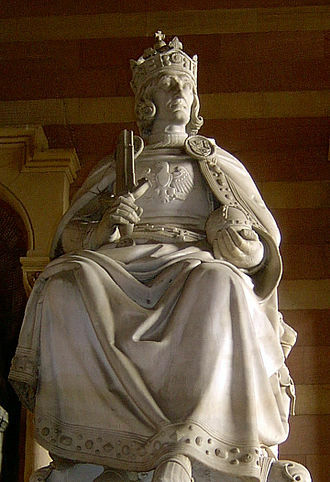 His expectations of imperial crown, were never fulfilled, Ottokar was the second son of King Wenceslaus I of Bohemia. He was possibly educated by the Bohemian chancellor Philip of Spanheim, when his brother Vladislaus died in 1247, Ottokar suddenly became the heir to the Bohemian throne. According to popular tradition, he was profoundly shocked by his brothers death and did not involve himself in politics. 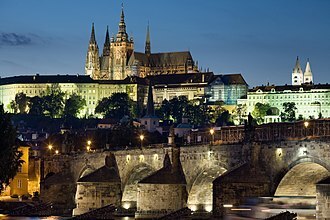 As new heir, his father appointed him Margrave of Moravia and Ottokar took his residence in Brno, in 1248 he was enticed by discontented nobles to lead a rebellion against his father King Wenceslaus. During this rebellion he was elected the younger King on 31 July 1248, Přemysl Ottokar II held the title of King of Bohemia until November 1249. However, he was excommunicated by Pope Innocent IV, whereafter Wenceslaus finally managed to defeat the rebels, King Wenceslaus had initially attempted to acquire Austria by marrying his heir, Vladislav, to the last dukes niece Gertrude of Babenberg. 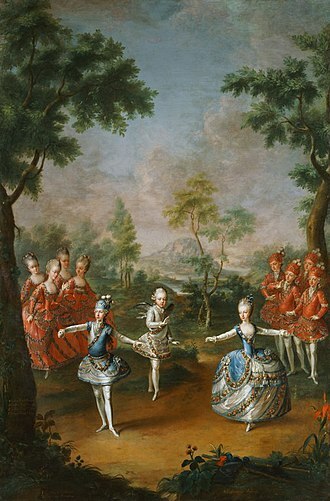 That match had been cut short by Vladislavs death and Gertrudes remarriage to the Zähringen margrave Herman VI of Baden, the latter was rejected by the Austrian nobility and could not establish his rule. Wenceslaus used this as pretext to invade Austria when Herman died in 1250 — according to some sources, Wenceslaus released Přemysl Ottokar very soon and in 1251 again made him Margrave of Moravia and installed him, with the approval of the Austrian nobles, as governor of Austria. The same year Ottokar entered Austria, where the estates acclaimed him as Duke, to legitimize his position, Přemysl Ottokar married the late Duke Frederick IIs sister Margaret of Babenberg, who was his senior by 30 years and the widow of the Hohenstaufen king Henry of Germany. Their marriage took place on 11 February 1252 at Hainburg, in 1253, King Wenceslaus died and Přemysl Ottokar succeeded his father as King of Bohemia. After the death of the German King Konrad IV in 1254 while his son Conradin was still a minor, his election bid was unsuccessful and Count William II of Holland, the German anti-king since 1247, was generally recognised. 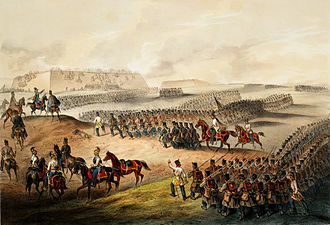 Feeling threatened by Ottokars growing regional power beyond the Leitha River, the conflict was quelled through papal mediation, it was agreed that Ottokar was to yield large parts of Styria to Béla in exchange for recognition of his right to the remainder of Austria. During the following peace phase, King Ottokar II led two expeditions against the pagan Old Prussians. 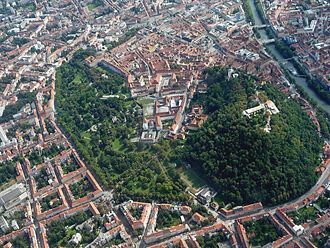 Königsberg, founded in 1255 by the Teutonic Order, was named in his honour, after a few years the conflict resumed and Ottokar defeated the Hungarians in July 1260 at the Battle of Kressenbrunn, ending years of disputes over Styria with Béla IV. Béla now ceded Styria back to Ottokar, and his claim to those territories was formally recognized by Richard of Cornwall, king of Germany and this peace agreement was sealed by a royal marriage. Rudolf I, known as Rudolf of Habsburg,1 May 1218 –15 July 1291, was Count of Habsburg from about 1240 and the elected King of the Romans from 1273 until his death. Rudolfs election marked the end of the Great Interregnum in the Holy Roman Empire after the death of the Hohenstaufen emperor Frederick II in 1250, the territories remained under Habsburg rule for more than 600 years, forming the core of the Habsburg Monarchy and the present-day country of Austria. Rudolf was the first king of the Romans of the Habsburg dynasty, Rudolf was born on 1 May 1218 at Limburgh Castle near Sasbach am Kaiserstuhl in the Breisgau region of present-day southwestern Germany. He was the son of Count Albert IV of Habsburg and of Hedwig, around 1232, he was given as a squire to his uncle, Rudolf I, Count of Laufenburg, to train in knightly pursuits. At his fathers death in 1239, he inherited estates from him around the ancestral seat of Habsburg Castle in the Aargau region of present-day Switzerland as well as in Alsace. 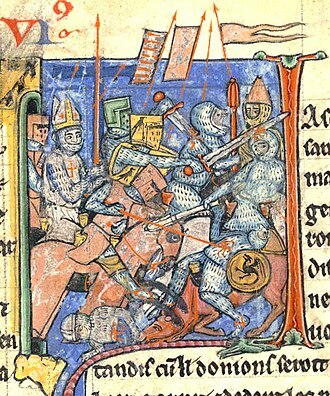 In 1242, Hugh of Tuffenstein provoked Count Rudolf through contumelious expressions, in turn, the Count of Habsburg had invaded his domains, yet failed to take his seat of power. 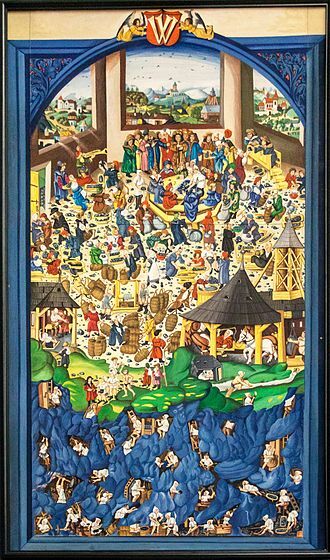 As the day passed on, Count Rudolf bribed the sentinels of the city and gained entry, in 1244, to help control Lake Lucerne and restrict the neighboring forest communities of Uri and Unterwalden, Rudolf built near its shores Neuhabsburg Castle. 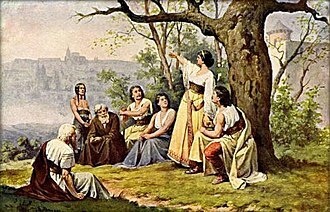 In 1245 Rudolf married Gertrude, daughter of Count Burkhard III of Hohenberg and he received as her dowry the castles of Oettingen, the valley of Weile, and other places in Alsace, and he became an important vassal in Swabia, the former Alemannic German stem duchy. 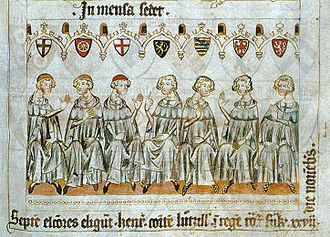 That same year, Emperor Frederick II was excommunicated by Pope Innocent IV at the Council of Lyon, Rudolf sided against the Emperor, while the forest communities sided with Frederick. This gave them a pretext to attack and damage Neuhabsburg, Rudolf successfully defended it and drove them off. As a result, Rudolf, by siding with the Pope, gained more power, in 1254, he engaged with other nobles of the Staufen party against Bertold II, Bishop of Basle. When night fell, he penetrated the suburbs of Basle and burnt down the local nunnery, Pope Innocent IV excommunicated him and all parties involved. As penance, he took up the cross and joined Ottokar II, whilst there, he oversaw the founding of the city of Königsberg, which was named in memory of King Ottokar. 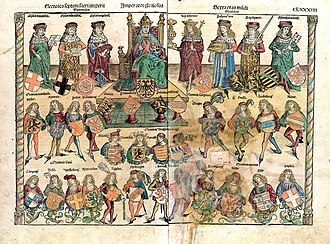 The disorder in Germany during the interregnum after the fall of the Hohenstaufen dynasty afforded an opportunity for Count Rudolf to increase his possessions. His wife was a Hohenberg heiress, and on the death of his childless maternal uncle Count Hartmann IV of Kyburg in 1264, he seized his valuable estates. Successful feuds with the Bishops of Strasbourg and Basel further augmented his wealth and reputation, including rights over various tracts of land that he purchased from abbots and these various sources of wealth and influence rendered Rudolf the most powerful prince and noble in southwestern Germany. In the autumn of 1273, the prince-electors met to choose a king after Richard of Cornwall had died in England in April 1272. An Imperial Crown is a crown used for the coronation of emperors. Crowns in Europe during the medieval period varied in design, An open crown is one which consists basically of a golden circlet elaborately worked and decorated with stones or enamels. The medieval French crown was of this type, the closed crown, which had bands of metal crossing usually from one side to the other and from back to front so that they met in the middle, at the top of the head. A special case of a crown was that of the Holy Roman Empire. Strictly speaking, the type of crown whose characteristics can properly be regarded as imperial was one with a single crest running from front to back. In practice, in countries unfamiliar with closed crowns at all, during the medieval era the crowns worn by English kings had been described as both closed and open designs. This was in contrast with kings of France who always wore an open crown, the use of a closed crown may have been adopted by the English as a way of distinguishing the English crown from the French crown, but it had other meanings to some. Velvet is a type of woven tufted fabric in which the cut threads are evenly distributed, with a short dense pile, giving it a distinctive feel. By extension, the word velvety means smooth like velvet, Velvet can be made from either synthetic or natural fibers. Velvet is woven on a loom that weaves two thicknesses of the material at the same time. The two pieces are cut apart to create the pile effect, and the two lengths of fabric are wound on separate take-up rolls. This complicated process meant that velvet was expensive to make before industrial power looms became available, Velvet is difficult to clean because of its pile, but modern dry cleaning methods make cleaning more feasible. Velvet pile is created by warp or vertical yarns and velveteen pile is created by weft or fill yarns, Velvet can be made from several different kinds of fibers, the most expensive of which is silk. Much of the velvet sold today as silk velvet is actually a mix of rayon, Velvet made entirely from silk is rare and usually has market prices of several hundred US dollars per yard. Cotton is used to make velvet, though this results in a less luxurious fabric. Velvet can be made from such as linen, mohair. A cloth made by the Kuba people of the Democratic Republic of Congo from raffia is often referred to as Kuba velvet. More recently, synthetic velvets have been developed, mostly from polyester, viscose, acetate, a small percentage of spandex is sometimes added to give the final material a certain amount of stretch. Because of its softness and appearance as well as its high cost of production. Velvet was introduced to Baghdad during the rule of Harun al-Rashid by Kashmiri merchants, in the Mamluk era, Cairo was the worlds largest producer of velvet. Much of it was exported to Venice, Al-Andalus and the Mali Empire, musa I of Mali, the ruler of the Mali Empire, visited Cairo on his pilgrimage to Mecca. Many Arab velvet makers accompanied him back to Timbuktu, Ibn Battuta mentions how Suleyman, the ruler of Mali, wore a locally produced complete crimson velvet caftan on Eid. Sapphire is a gemstone, a variety of the mineral corundum, an aluminium oxide. It is typically blue in color, but natural fancy sapphires occur in yellow, orange, the only color which sapphire cannot be is red - as red colored corundum is called ruby, another corundum variety. This variety in color is due to amounts of elements such as iron, chromium, copper. Commonly, natural sapphires are cut and polished into gemstones and worn in jewelry and they may be created synthetically in laboratories for industrial or decorative purposes in large crystal boules. Sapphire is the birthstone for September and the gem of the 45th anniversary, a sapphire jubilee occurs after 65 years. Sapphire is one of the two gem-varieties of corundum, the other being ruby, although blue is the best-known sapphire color, they occur in other colors, including gray and black, and they can be colorless. A a pinkish orange variety of sapphire is called padparadscha, significant sapphire deposits are found in Eastern Australia, Sri Lanka, Madagascar, East Africa, and in North America in a few locations, mostly in Montana. 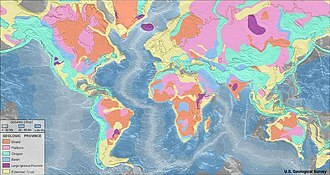 Sapphire and rubies are often found in the geological setting. Every sapphire mine produces a range of quality - and origin is not a guarantee of quality. 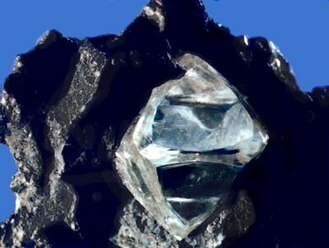 For sapphire, Kashmir receives the highest premium although Burma, Sri Lanka, the cost of natural sapphires varies depending on their color, size and overall quality. For gems of exceptional quality, an independent determination from a respected laboratory such as the GIA, gemstone color can be described in terms of hue and tone. Hue is commonly understood as the color of the gemstone, saturation refers to the vividness or brightness of the hue, and tone is the lightness to darkness of the hue. Blue sapphire exists in various mixtures of its primary and secondary hues, various tonal levels, blue sapphires are evaluated based upon the purity of their primary hue. Purple and green are the most common secondary hues found in blue sapphires and purple can contribute to the overall beauty of the color, while green is considered to be distinctly negative. 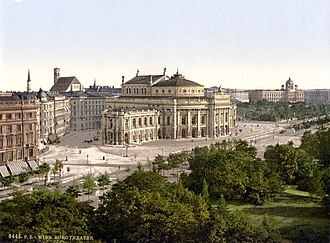 Hofburg Neue Burg section, seen from Heldenplatz. The statue of Archduke Charles is also pictured. Inner courtyard of the Lesliehof. Joanneum Quarter under construction – Neutorgasse building (right) and the rear of the Lesliehof (center-left).